A customer data platform’s most important job is making the entire customer journey accessible across all the major touch points. Segment focuses on collecting 10 core customer data streams: mobile, web, server, offline, support, sales, email, marketing automation, advertisement, and payments. It’s fairly rare for us to see customers collect data from only one source. In fact, 90% of our business tier customers collect from multiple sources, and the average is 4 or more sources. 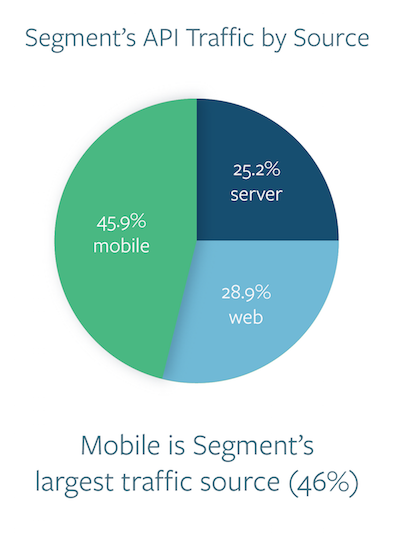 Comparing mobile vs. web vs. server, mobile turns out to be the largest traffic source. Our iOS and Android libraries have been open sourced since March 2013, and are now powering the analytics stack for over 3,000 mobile apps, including HomeAway, HotelTonight, Instacart, VSCO and DraftKings. Collectively, these apps have over 500 million downloads. Note: mobile web is counted as web here. (P.S. if you’re collecting data from the mobile web, Segment can now collect analytics from AMP-powered sites). Which mobile SDK is most popular? 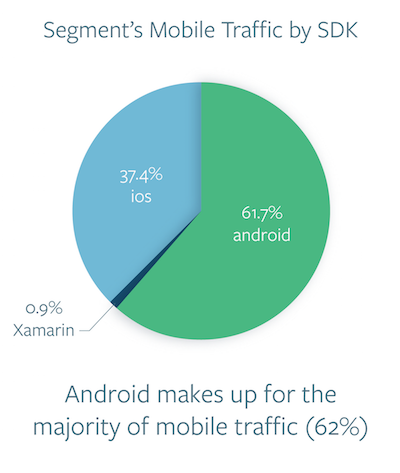 Out of the competitors (Android, iOS and Xamarin), Android takes the cake! Server data makes up 25% of our total API traffic. Because our server libraries perform batching and validation automatically, we see customers almost always preferring to send data from our server libraries rather than directly to the HTTP API. Eighty-two percent of total server traffic originates from Segment-supported server libraries. 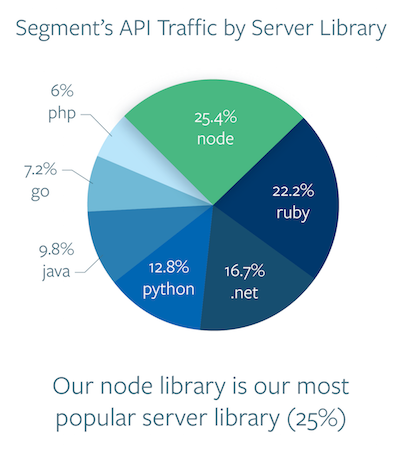 Across all the server libraries, traffic from Segment’s node library is by far the winner. At Segment, our goal is to make customer data easy to use and accessible across your entire organization. Collect — Gather user data from your website, mobile apps, servers, and cloud services. Structure — Abstract your data into user identities, actions, and business objects. Integrate — Send the data to more than a hundred tools for analytics, email, and more with the flip of a switch. Access — Load your raw data into a relational database without building a data pipeline. With each new source, we are building a more complete customer data platform. Want to learn about and grow your mobile users? Sign up today. Interested in building infrastructural components for mobile apps and SDKs? We’re hiring.